In this circuit the intensity of LED will vary in a ramping fashion. 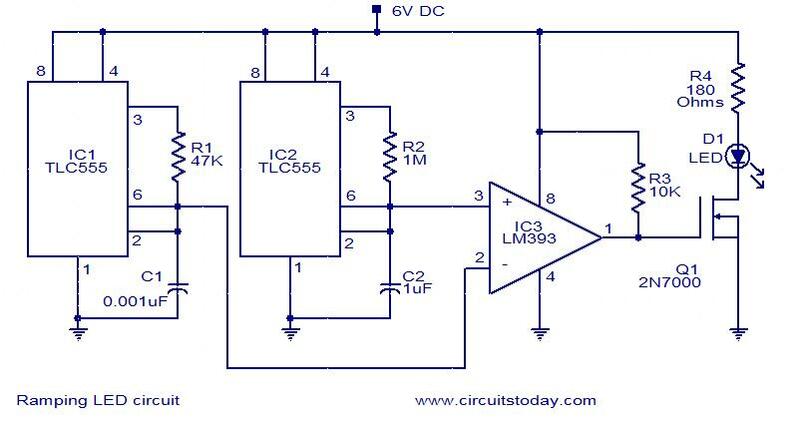 The circuit consists of three ICs: Two 555 timer ICs and one LM393 op-amp. IC1 and IC2 are wired as oscillators to produce 10 KHz and 1 Hz frequencies respectively.These two frequencies are given to the inputs of the op-amp LM393.LM393 is wired as a comparator and its output will be a PWM signal. This PWM signals controls the FET Q1 to drive the LED. The LED will rise from OFF state to full brightness slowly and then slowly fades to OFF state and this operation repeats. The resistor R4 controls current through the LED. The power supply for this circuit can be anything between 3 to 12V. I recommend 6V for this circuit. The effect can be varied by changing the values of C1, C2, R1 or R2. what is the application of this circuit? Can I decrease the resistance of R1 and add more than 1 LED in series with one another? You can use 3 red LEDs by reducing the resistance R4 to 47 ohms. With yellow LEDs remove R4. White LEDs you can use only one. But you can parallel more LEDs,and the limiting current is 200 mA. LED pipe lighting are excellent alternatives to have when you are preparing on creating your home look a little more huge. When beautifying, you need to create sure that you select accessories that experience good. Many people do not know how to wire LED lights due to the accuracy required in the circuit values and the number of LEDs to use in a lighting circuit. For the circuit to work, you need to use accurate values for voltage, current, and resistance.